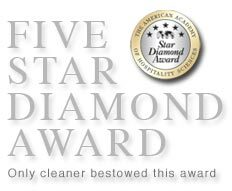 The prestigious 5 Star Diamond Award by The American Academy of Hospitality Sciences has recognized and awarded WORLD CLASS CLEANERS for its dedication to quality and service to its customers. This is not only a testament to our reputation built on honesty and quality service but an honor as the only dry cleaner in this highly competitive industry to be bestowed this coveted award. At WORLD CLASS CLEANERS we value our customers whom choose to use our full services whether it is specialty couture cleaning, expert tailoring, vintage restoration or cleaning of your everyday wear. Whatever your needs WORLD CLASS CLEANERS delivers top quality workmanship as your possessions are in the hands of skilled workers and master tailors whom take the utmost pride in their craft. All work is done in our full storage facility and WORLD CLASS CLEANERS is always seeking new ways to exceed our customers’ expectations. We at WORLD CLASS CLEANERS are continuously working with current technology such as our exclusive photo document storage and keeping ahead of industry standards. WORLD CLASS CLEANERS was awarded the ‘2010 Green Star Diamond Award’. We are ‘a green culture company and environmentally sound’. Our quality service extends to a reliable pickup and delivery service in the Manhattan area. Pickup and delivery can be done by submitting our order form before 10AM and items will be picked up the same day. Our store hours are Monday – Friday 8:00am – 6:30pm and Saturdays 8:00am – 5:00pm.